Hasbro's flagship Transformer this year is a giant bi-polar Bumblebee, with two modes—Battle and Guardian—that have different personalities. Fair enough. But can somebody explain the samurai Transformer that turns into a tank? PAWTUCKET, R.I. (February 12, 2010) - On the heels of launching 2009's largest grossing movie and in anticipation of the next installment in 2011, the TRANSFORMERS brand from Hasbro, Inc. (NYSE: HAS) ramps up the play in 2010 with new offerings that build on the energy and excitement from the brand's history and blockbuster film franchise. Featuring over-the-top action figures, unique role-play items and innovative twists on the TRANSFORMERS brand signature play pattern, the 2010 lineup offers dozens of toys, two exciting promotions and an expansive worldwide licensing program across all major categories to satisfy to satisfy and excite the brand's ever-expanding fan base. This spring the AUTOBOTS, the heroic protectors of Earth, need help from their human allies in the N.E.S.T. GLOBAL ALLIANCE as the planet continues to face threats from the evil DECEPTICONS. Hasbro is inviting kids and fans to join the alliance through a special promotion that is currently underway. By collecting three stickers included in specially marked TRANSFORMERS products, kids and fans can join the N.E.S.T. GLOBAL ALLIANCE and mail away for a special edition RAVAGE figure not available anywhere else. The promotion requires a payment of $4.95 for shipping and handling charges to receive the special edition figure and the offer is good while supplies last. Requests must be postmarked by April 30 and received by May 14. Then, in the fall, kids can ‘live' the TRANSFORMERS adventure as the "Hunt for the DECEPTICONS" promotion begins. Look for exciting details about this interactive promotion later in the year. If fans can't wait until 2011 for the next TRANSFORMERS movie they can watch online webisodes of "Cyber Missions," featuring new TRANSFORMERS adventures. "Cyber Missions" finds the AUTOBOTS working with humans in the N.E.S.T. global alliance to defend Earth against the revenge-seeking DECEPTICONS. There will be 12 webisodes total which began airing online at www.TRANSFORMERS.com in early January and new webisodes will continue to air throughout the year. 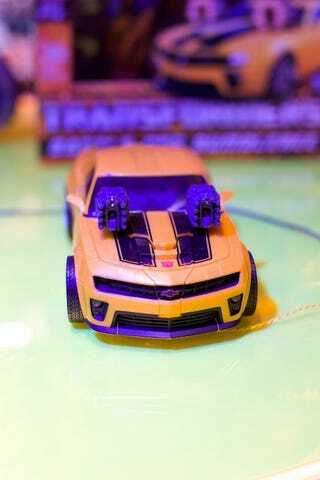 BUMBLEBEE continues to be one of the most popular TRANSFORMERS heroes as he acts as both a defender and a warrior for good. The new BATTLE OPS BUMBLEBEE action figure continues to push the boundaries of TRANSFORMERS toy innovation and showcases two sides of BUMBLEBEE with features unique to each of these roles. For example, when serving as a guardian, BUMBLEBEE features more playful phrases along with authentic engine sounds and lights. Then, when converted into battle mode, BATTLE OPS BUMBLEBEE has missile launchers that pop out, a converting plasma cannon that lights up, and phrases that change to reflect his battle personality. Expanding upon the essence of DEVASTATOR - a robot built by combining multiple construction vehicles - the TRANSFORMERS brand unveils the new POWER CORE COMBINERS expression that redefines the magic of combination play. The toys deliver an interchangeable system of robots, vehicles and weapons that escalates the level of fun and increases the number of robots within a child's TRANSFORMERS toy universe. For those wanting to engage in heroic AUTOBOT role play, the TRANSFORMERS line offers new items including the OPTIMUS PRIME CYBER SWORD toy which features lights, battle and conversion sounds, as well as key phrases from OPTIMUS PRIME. And for the youngest AUTOBOT-in-training, the TRANSFORMERS brand unveils the new ACTIVATORS expression of action figures. Designed with the youngest TRANSFORMERS fans in mind, ACTIVATORS toys feature easier conversion from vehicle to robot modes than traditional TRANSFORMERS figures and are available in popular characters such as OPTIMUS PRIME, BUMBLEBEE and MEGATRON. For more information about TRANSFORMERS promotions and products, consumers can visit www.TRANSFORMERS.com. For more than 25 years, TRANSFORMERS action figures have been known as "ROBOTS IN DISGUISE," providing fans with the enjoyment of converting incredibly detailed, realistically styled vehicles into awesome battling alien robots. In 2010, Hasbro is offering a wide variety of all-new versions of fan-favorite characters, including OPTIMUS PRIME, BUMBLEBEE, MEGATRON and STARSCREAM in an array of scales: DELUXE, VOYAGER (larger scale), and LEADER (largest scale and includes lights and sounds). The all-new BATTLE OPS BUMBLEBEE action figure is ready for battle! This large-scale figure truly shows fans the AUTOBOT hero's personality, both as a protector of Earth and a warrior against the evil DECEPTICONS. With two distinct modes – Battle and Guardian – BATTLE OPS BUMBLEBEE features a variety of electronic sounds and lights, accompanied by a converting plasma cannon. The TRANSFORMERS POWER CORE COMBINERS introduce fans to an all-new assortment of figures that expand on the classic play pattern of the popular "ROBOTS IN DISGUISE." This new expression of figures combine with one another, in dozens of variations, to create a wide variety of larger COMBINER robots, with each figure serving as various body parts and weapons. Available in 2-packs and 5-packs. The TRANSFORMERS POWER CORE COMBINERS 2-Pack includes one SCOUT scale TRANSFORMERS figure and one MINI-CON scale figure. The SCOUT scale figure features a ‘robot' mode and a ‘vehicle' mode. The MINI-CON scale figure has four modes: ‘robot' mode, robot weapon, vehicle weapon and Power-up Armor for combining with the central SCOUT scale figure in both robot and vehicle mode. 2-Pack figures are interchangeable with 5-Pack figures. The TRANSFORMERS POWER CORE COMBINERS 5-Pack features teams of TRANSFORMERS characters that can combine together to form one large TRANSFORMERS figure. Each team consists of one SCOUT scale figure and four LEGENDS scale vehicles. The SCOUT scale figure features one ‘vehicle' mode and two ‘robot' modes and each of the LEGENDS scale vehicles can plug into the specially marked ports on the central SCOUT scale figure to instantaneously convert into an arm or leg using auto-conversion technology. All figures can be swapped out with one another to form multiple different combinations and new figures. 5-Pack figures are interchangeable with 2-Pack figures. TRANSFORMERS ACTIVATORS toys, a new expression within the TRANSFOMERS toy line, feature conversion from vehicle to robot modes that's easier than traditional TRANSFORMERS figures. Designed with the younger child in mind, conversion is triggered by pressing the AUTOBOT or DECEPTICON shield located on the figure and require only a few steps to fully change modes. TRANSFORMERS ACTIVATORS figures feature popular characters including BUMBLEBEE, OPTIMUS PRIME and MEGATRON. The TRANSFORMERS OPTIMUS PRIME CYBER SWORD allows kids to role play just like the fearless leader of the AUTOBOTS and reenact their favorite battle scenes. Kids will enjoy its electronic lights, battle and conversion sounds, as well as key movie phrases. Created specifically for the ACTION FLEET TRANSFORMERS line of mini-vehicles, kids can join the adventure and help BUMBLEBEE and OPTIMUS PRIME defeat the evil MEGATRON by racing to victory with the new ACTION FLEET TRANSFORMERS BATTLE TRACK set. The glory of winning depends on your skill; launch the BUMBLEBEE mini-vehicle, exclusive to this track set, at the correct time and send it crashing into MEGATRON who will crumble in defeat. Introduced in 2009, TRANSFORMERS mini-vehicles feature the robot version of characters unique to the TRANSFORMERS universe on the underside of each non-converting vehicle for easy identification. Featuring electronic lights and sounds, motorized conversions and firing projectiles, kids can "bring to life" the epic TRANSFORMERS battle with this new vehicle from the ACTION FLEET TRANSFORMERS line. For covert combat, watch as select parts of this OPTIMUS PRIME semi-truck vehicle convert with the touch of a button to reveal stealth mode weaponry hidden inside to battle the evil DECEPTICONS like no other vehicle available.